I have an extra router which is a DLINK – DIR-655, there are one input ethernet port and four output ethernet ports. 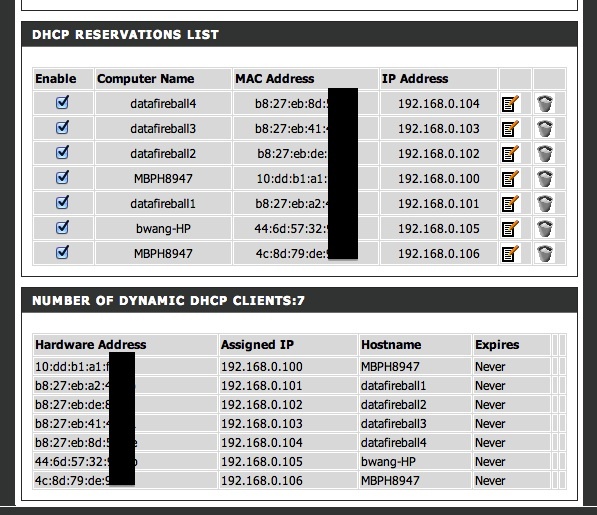 In this case, you use a network cable to connect the one of the output ethernets of the home router to the input of this cluster router. Now you have a local network, that I will connect the four raspberry PIs that I have to the physical ethernet ports and also connect my Macbook to the wireless of the cluster router. To make things easier, I reserved the IP addresses in the router DHCP settings, so whenever you plug or unplug the power/network cable.etc, your raspberry PI will also be assigned the same IP address since we created the MAC address to IP mapping in the router settings. Also, to make things easier, I made datafireball1, which supposed to be the master node can log into the other nodes password-less, which requires you to use ssh-keygen command to generate a key id_rsa.pub and copy that file to the .ssh folder every nodes, including the datafireball1 itself, and rename the file to authorized_keys. 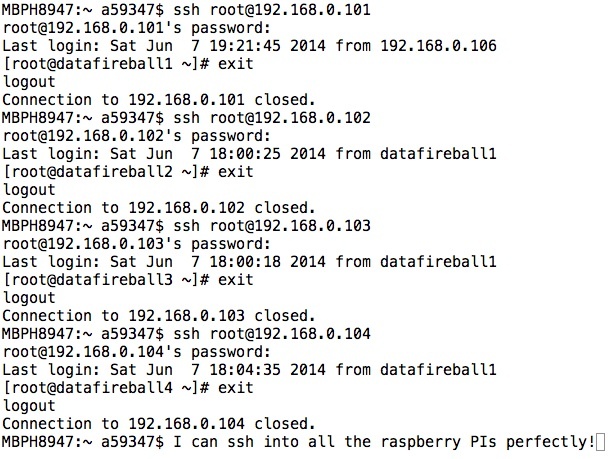 You probably want to ssh from datafireball1 to the other nodes first because it will ask you for the first time do you want to proceed or not and if so, add the all the nodes to the known_hosts. And from then on, you can log into the other nodes seamlessly. A few notes that might help the others. Even the sshd service has been turned on as default but I did not see the .ssh folder, I have to manually create it for the first time. Also, you don’t need many keyboards or mouses to control all the raspberry PIs. Once you have the ssh set up. You can operate on your macbook which is a much more friendly environment.